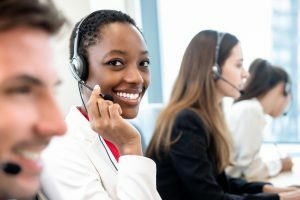 Aside from making sure that your large conference call service offers all the necessary features, it’s also vital that you have an operator skilled enough to support you in your conference calls. Handling large conference calls isn’t easy, more so if you aren’t used to facilitating calls. In such situations, relying on operator-assisted conference calls is advisable so you can focus on moderating the meeting and making sure the discussion is on the right track. What Skills Should an Operator Have to Ensure a Successful Conference Call? Having the right event conference call service isn’t enough, you must also have an operator with all the essential skills to effectively facilitate a conference call. Communication skills – Essential communication skills include knowing how to listen and provide an appropriate response. Since operators will be dealing with professional calls, it is important that they have good verbal skills and can communicate clearly while maintaining confidence and professionalism. Having effective communication skills will also give the moderator additional assurance that the conference will go smoothly. Good Memory – Operators often have to handle different kinds of companies as well as memorize multiple client names. Having good memory is a must in order for them to accurately follow a specific client’s instructions and not confuse it with other directions. Failing to do so may lead to dire consequences and threaten a conference call’s success. Reliable – Conference calls don’t always go smoothly and technical problems can suddenly occur. In such cases, an operator should know how to employ their expertise in the service; it is ideal to have an operator who remains calm and collected and can efficiently troubleshoot and resolve the issue. Vigilance – As the use of conferencing continues to increase, so do the risks that come with it. In order to counter these, companies have relied on operator-assisted calls to increase its security — hence, having a vigilant or alert operator who can quickly notice something suspicious and act on it is advisable. Flexible – Dealing with numerous conference calls also means encountering all kinds of people with varying demands. The ability to adapt to any given situation and properly interact with individuals from different backgrounds is vital in making sure that the conference call won’t go out of hand. There are also cases where operators might encounter participants who aren’t tech-savvy so explaining how things work might take longer than necessary. In these cases, the operator must remain patient and make sure that all participants understand everything before moving on. Organized – Operators are not only active during a live conference call but they also offer pre-call and post-call assistance. These include doing a tech-check for each participant to make sure they are ready for the live call, participant verification, dialing-out to participants, and generating custom reports regarding participants and the discussion that took place.